Myrna Bernard, Director of Human Development at the CARICOM Secretariat. Recognising the need for a multi-faceted approach to address various crime and security challenges in Barbados and across the region, a number of institutions will be working to implement the 10th EDF CARIFORUM Crime and Security Cooperation Programme. 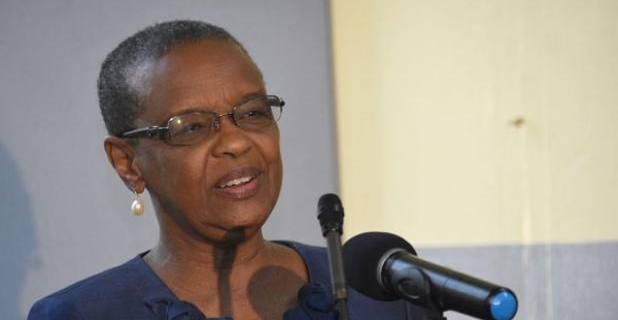 Myrna Bernard, Director of Human Development at the CARICOM Secretariat revealed the above recently, as the programme was launched in Barbados. “In order to address these problems jointly, CARIFORUM and the European Union concluded a Financing Agreement for the 10th EDF CARIFORUM Crime and Security Cooperation Programme (in) November 2014. It is intended to address institutional responses to major crime and security challenges, which pose increasingly serious threats to our development,” she revealed. “The Programme adopts a comprehensive, multi-faceted approach to crime and security. In doing so, it focuses on drug demand and supply reduction, crime prevention and social development, capacity-building of law enforcement and security agencies, and enhanced cooperation with third states,” she further commented. The Director noted that the overall programme is being implemented through several institutions, the major ones being the Regional Security System (RSS), the Implementing Agency for Crime and Security IMPACS), the Caribbean Financial Action Task Force (CFATF), the National Drugs Control Directorate of the Dominican Republic and the Caribbean Community Secretariat (CCS). She explained that the RSS 10th EDF Programme of activities seeks to contribute to capacity-building and institutional response to illicit drug trafficking, by strengthening capacities of law enforcement/border security officials to address illicit trafficking and enhance existing rehabilitation initiatives in correctional facilities for drug offenders. “Under the CARIFORUM/EU initiative, the RSS focusses on drug supply reduction, through a plethora of capacity-building activities among border security personnel. The project aimed to promote required skills, attitudes and competencies of law enforcement officers when dealing with drug addiction inter alia among inmates. This was achieved in part, through the conduct of coaching programmes, which focused on rehabilitative care in correctional facilities for drug offenders, as well as safeguarding human rights in rehabilitating drug offenders. These programmes were conducted in 2017, with assistance from the Criminal Justice Research and Planning Institute (Barbados) and competent officers at the correctional facility in Barbados,” she said. With regard to the CARICOM Implementation Agency for Crime and Security (IMPACS), she indicated that the programmes implemented by IMPACS commenced in January 2016. They focus on strengthening the technical and human capacity of the CARICOM region to prevent, detect and minimise the opportunity for illegal activity at the borders and within CARICOM Member States and to enable higher conviction rates on crimes perpetrated. “In doing so, it targeted initiatives to enable Customs authorities to identify in advance, high-risk shipments that have the potential to threaten the safety and security of the Region” she stated. “Beneficiary states will receive Advance Cargo Information in electronic format through a centralised portal, through Advanced Cargo Information Systems (ACIS). Law Enforcement Officers were also provided with data on passengers and crew members prior to arrival and departure from CARICOM Member States, through Advanced Passenger Information Systems and monitored if considered high security threats to the region,” she added.